Listen to Valerie’s most recept podcast, Holloween Drinks for Grown Ups and check out her recent Broadway reviews. Halloween drinks for grown ups….delicious seasonal cocktails! Recently I saw two plays, both with small casts, each dealing with love relationships, and the past coming back to assault the present with a vengeance. Old Times, written by Harold Pinter, features interplay between a trio: a husband and wife, and a female friend of the wife who, after many years, drops in on the couple. Lots of drinking, sexual power play, clever conversation and banter between the three take place, leaving the audience a bit confused over who is interested in whom. Pinter also provides ambiguity about the relationship between the two women. No doubt, there is sexual heat displayed by all three. Clive Owen is making his Broadway debut in Old Times. He was quite good, and at ease on stage. The two women, Eve Best and Kelly Reilly are equally as good. The set is minimalistic. Old Times, directed by Douglas Hodge, is only 65 minutes with no intermission, so not a huge investment of time on the part of the audience. I personally didn’t love the piece at all, because I did not feel connected to the characters or the story, however I appreciated the talents of the performers and the fine acting by all three. Old Times runs through Nov. 29 at the Roundabout Theatre. 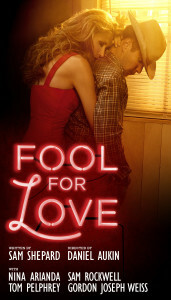 Fool for Love, written by Sam Shepard, is only slightly more interesting and engaging then Old Times, but not by much. The story: we find two former lovers at a ratty motel in the middle of nowhere in the Mojave Desert. As the play unfolds, we learn that these two had a past, many times over, and although they can’t be together, they also can’t stay away from each other. Some dark secrets are revealed. The on-again off- again passionate lovers are seemingly caught forever in their endless web of intrigue. That’s pretty much the whole story. There is one very good reason, though, to see this play. And that is to see Nina Arianda. She is, as always, an extremely compelling performer. Ms. Arianda has been consistently wonderful in every piece she is cast in. Her command of the stage and the material is always so impressive. Sam Rockwell stars opposite Arianda, Gordon Joseph Weiss plays the old man who is the narrator and the conscience of the piece, and Tom Pelphrey is the man who comes calling. Daniel Aukin directs. Fool for Love explodes in passionate performance, but like with the characters in Old Times, by the end of the play, we just don’t care. Now at the Manhattan Theatre Club.